The Bay Area has been called home by some of the greatest baseball players of all time. That got me thinking. Who would be on the all Bay Area, all-time 25-man roster. Here’s who I chose and why I chose them. 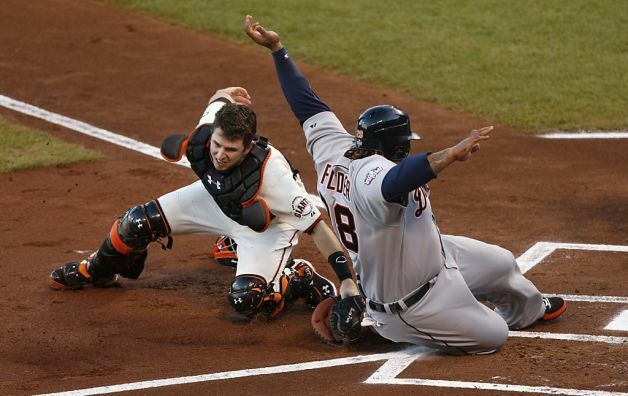 Buster Posey tags out Prince Fielder in Game 1 of the 2012 World Series. C: Buster Posey– The bay area has never had a superstar catcher. Posey is the closest to that. In Posey’s young career, he already has 2 World Series rings, an MVP, a Rookie of the Year, Comeback Player of the year, a Silver Slugger, and is a 2 time All-Star. Not to mention he is also a lifetime .308 hitter. So maybe there is a superstar catcher in the bay area after all. 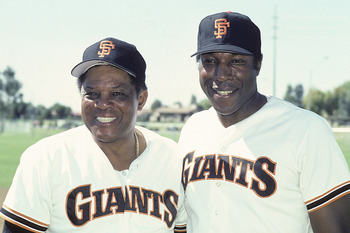 1B: Willie McCovey– Willie Mac played 19 seasons with the Giants. He was a 6 time All-Star, MVP, ROY, and has 521 career HRs. He was called the “Scariest Hitter in baseball” by pitcher Bob Gibson, and has his #44 retired by the Giants. He was inducted into the Baseball Hall of Fame in 1986. He even has the San Francisco China Basin named after him, McCovey Cove. 2B: Jeff Kent– 2B is also a week position in the bay area. Kent wins the spot because he had the best seasons of his career while playing for the giants. In 2000, he hit 33 HR, 125 RBI, .334 BA, and a .986 fielding percentage. He won the MVP that year, beating out teammate Barry Bonds. He finished his career totaling 5 All-Star appearances, and 6 Silver Slugger awards. 3B: Sal Bando– Another weak position in the bay area. Sal Bando wins this spot because he was a 4-time All-Star and was part of the A’s forgotten dynasty that won 3 consecutive World Series. His defense is what secured this position for him however. Among retired players in his position, Bando is 6th in assists with 3720 and 7th in double plays with 345. He was also barely the 2nd 3B of all-time to reach 200 career HRs. He finished with 242. SS: Bert Campaneris– Campy was an easy pick for me. He holds the A’s franchise records for career games (1795), hits(1882) and at bats (7180). He led the AL in stolen six times from 1965 to 1972 and retired with the seventh most steals in history (649). Plus his 3 World Series rings help. 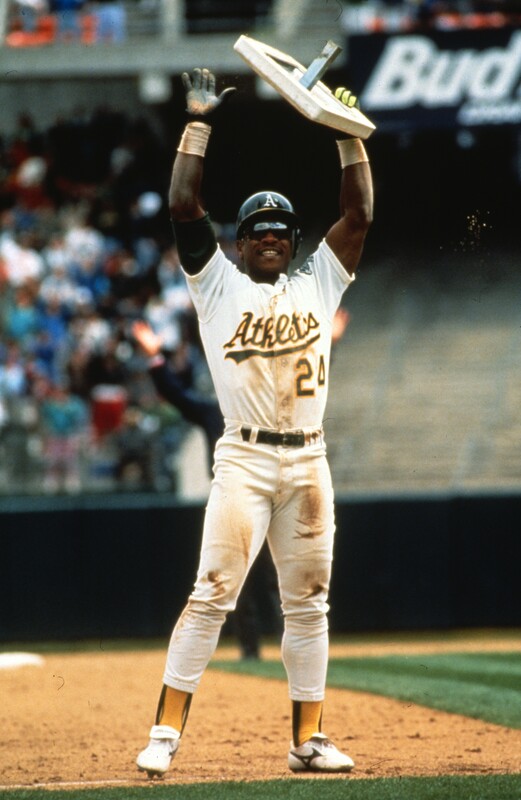 Rickey Henderson celebrates stolen base no. 939 breaking the All-Time sb record. LF: Rickey Henderson– The Man of Steal is the greatest lead-off hitter and base runner of all-time. The HOFer holds the single season stolen base record with 130 stolen bases and is the only AL player to ever steal over 100 bases in a season, which he did 3 times. He was a 12 time stolen base champion and led the league in runs scored 5 times. He is a 10 time All-Star, 2 time WS champ, 3 time Silver Slugger, and has an MVP. Not to mention he holds the Major League Records in All-Time Stolen Bases (1,406), Most Runs Scored (2,295), Games Led Off with a HR (81), Most unintentional Walks (2,129), and Most Stolen Bases in a single PostSeason Series (8). So I guess you could say this was an easy choice. His #24 is retired by the A’s. CF: Willie Mays– The Say Hey Kid is perhaps the greatest baseball player that ever lived. He is a 24 time All-Star, 12 Golds Gloves, 2 time MVP, ROY, and had 8 consecutive 100+ RBI seasons. He is considered the best 5-tool player that has ever lived. He is a first-ballot HOFer and has his #24 retired by the Giants. He was also elected to both the MLB All-Time team and the MLB All-Century team. Oh yeah and did I mention the address of AT&T Park: 24 Willie Mays Plaza. For a guy that didn’t want to move to San Francisco, he sure loves it now. RF: Reggie Jackson– This was another easy choice for me. Mr. October was a 14-time All-Star and 5 time World Series champion, 2 time Silver Slugger, and an MVP. This HOFer also has his number retired by two teams. #9 by the A’s and #44 by the Yankees. And he was one of the most important members of the 3 time WS Champion A’s. He may like to associate with the Yankees, but when he visits the A’s for WS reunions, man does he look good in the Green and Gold. DH: Jason Giambi– OK maybe he juiced a little, but his numbers can’t be ignored. Giambi is a 5 time All-Star, 2 time Silver Slugger, and an MVP. He led the American League in walks four times, in OBP three times, and in doubles and in slugging percentage once each. He was important to the A’s in their consecutive 100+ win seasons. 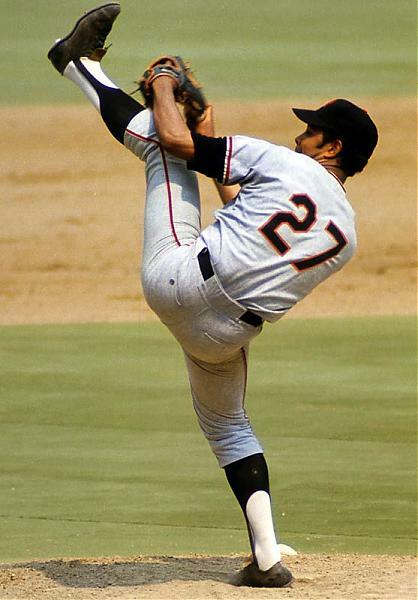 Juan Marichal’s iconic high leg kick. SP: Juan Marichal– Although he was often overshadowed by pitcher like Sandy Koufax and Bob Gibson, HOFer Marichal actually won more games than they did in that same era. He was a lockdown pitcher, fitting to be the Ace of this staff. He is a 10 time All-Star, pitched a no-no, and has his #27 retired by the Giants. 2SP: Catfish Hunter– Hunter could have also been the Ace of this staff. This HOFer is an 8 time All-Star, 5 time WS Champ, has a Cy Young, perfecto, and has his #27 retired by the A’s. He was the first pitcher since 1915 to win 200 career games by the age of 31. And he was part of the mustache bunch. What could be better? 3SP: Gaylord Perry– Perry is a 5 time All-Star, AL & NL Cy Young, and has pitched a no-no. He is a HOFer and has his #36 retired by the Giants. Not too shabby for the third pitcher in this rotation. 4SP: Vida Blue– Good ol’ Vida! He should be a HOFer. He is a 6 time All-Star, 3 time WS Champ, MVP, Cy Young, and has pitched a no-hitter. Vida has pitched well enough on both the Giants and the A’s to win the 4th spot in this rotation. 5SP: Dave Stewart– Dave Stewart is another underrated pitcher in the national media, but he is an all-time great to Oakland A’s fans. He is an Oakland native that has been an All-Star, a 3 time WS Champ, and a WS MVP. He was a 20+ game winner for 4 consecutive years and is best known for his work in the 1989 WS between the Oakland A’s and San Francisco Giants. He shutout the Giants in Game 1 and pitched Game 3 because of the iconic Loma Prieta earthquake. He makes the perfect 5th starter for this incredible rotation. Rollie Fingers– Rollie is a 7 time All-Star, 3 time WS Champ, MVP, Cy Young, 3 time Saves Champion and has his number #34 retired by the Milwaukee Brewers and Oakland A’s. He was only the 2nd reliever to ever be inducted to the HOF. Brian Wilson– He may be the most hated man in San Francisco, but his ability is undeniable. He is a 3 time All-Star, WS Champ, and an NL Saves Champ. In 2010, he finished with 48 saves and posted a 1.81 ERA. Fear the beard. 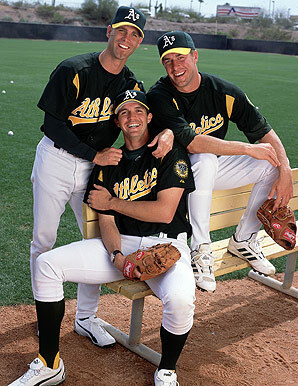 Barry Zito– Zito in his A’s era would be an amazing Lefty specialist. He is a 3 time All-Star, Cy Young, and Wins Champ all with the A’s. Oh yeah and he has 2 WS rings with the Giants. Boom. Tim Hudson– As one of the most consistent pitchers in the A’s history, Huddy earns a spot in the pen. He is a 3 time All-Star, was an AL Wins leader, and is 1 of only 4 pitchers currently active with 200+ wins. Tim Lincecum– The Freak is a 2 time WS Champ, 2 Cy Youngs, 4 time All-Star, 3 time strikeout leader, and pitched a no-no last season. In the 2012 postseason he showed the kind of weapon he could be coming out of the bullpen. 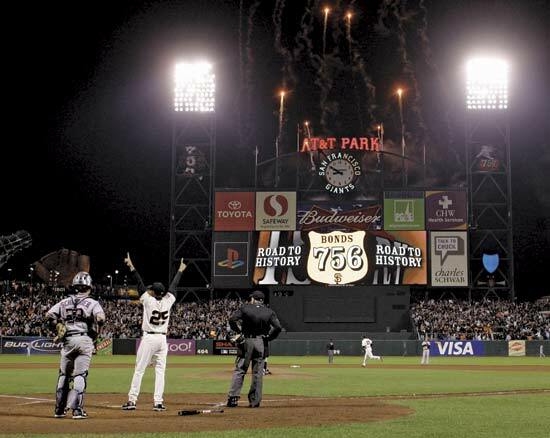 Barry Bonds celebrating record HR no. 756. 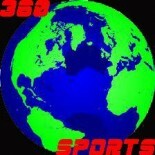 OF: Barry Bonds– The HR King starts off our bench. He is a 14 time All-Star, 8 time Gold Glove, 12 time Silver Slugger, and 7 MVPs. He holds too many records to countless including 762 career HRs. Why is he not a starter? Rickey, Mays, and Jackson. That’s why. C: Terry Steinbach– He is the best catcher to ever appear in a A’s uniform. He is a 3 time All-Star and a WS Champ. He would make a great back-up catcher to Posey. UTL: Orlando Cepeda– You know your bench is good when you have a HOFer sitting on it. He is a super utility man. His accolades include 11 All-Star appearances and an MVP. SS: Rich Aurilia– Rich hit the way shortstops were not supposed to hit: for power. He led NL SS in HRs for 3 straight years, not to mention he was deadly in the postseason. In 14 postseason games that season, he batted .296, with 5 homers and 14 RBI. Yup, that’s a NL SS record. 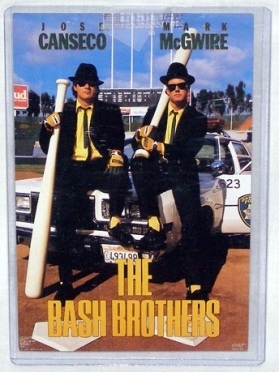 The Bash Brothers: Jose Canseco and Mark McGwire. 1B: Mark McGwire– This former ROY has stats that include 12 All-Star appearances, 3 Silver Slugger awards, and 2 WS rings. He was also elected the MLB’s All-Century team. That’s a whole lotta BASH! Alternates: Mark Mulder, Jose Canseco, Bobby Bonds.– There is just not enough room for these more than qualified players. They make the 40-man roster however. But that’s another post. This entry was posted on December 9, 2013 by Idalia Topete in Analysis, MLB, Uncategorized and tagged Buster Posey, Cy Young, San Francisco, San Francisco Giants, Silver Slugger, Silver Slugger Award, Tim Lincecum, Willie Mays.